High Street, Polesworth - Mark Webster & Co.
***A SUPERIOR DOUBLE FRONTED HOME - VERY SPACIOUS ACCOMMODATION - DESIRABLE VILLAGE LOCATION - IMPRESSIVE ENTRANCE HALL - DETACHED DOUBLE GARAGE***. For sale with MARK WEBSTER estate agents is this magnificent home that offers very grand accommodation that briefly comprises: Through hallway with centre staircase, guest WC, study, family room, rear lounge, impressive breakfast kitchen, utility room, dining room, gallery landing, master bedroom with en-suite, three further double bedrooms, spacious family bathroom, gated driveway, detached double garage and well cared for gardens. Internal viewing of this fine home is considered essential. Two double glazed windows to front aspect, carpeted flooring and under floor heating. Laminate flooring, double glazed window and under floor heating. Karndean flooring, under floor heating, low level wc, wash hand basin and extractor fan. Twin double glazed French doors to rear garden, feature fireplace with marble heath and surround, multi fuel burner inset, two double glazed windows to side aspect, 55" plasma TV with built in wall surround and sound system, carpeted flooring and under floor heating. Carpeted flooring, two double glazed windows to front aspect, feature fireplace with marble hearth and surround and under floor heating. Two double glazed windows to rear aspect, fitted base and eye level units, granite working surface, centre island with sink inset and storage, wine cooler, dishwasher, microwave and coffee machine, gas hob and fan oven, space for appliances, karndean flooring and under floor heating. Double glazed window to side aspect, fitted base and eye level units, roll edge working surface, tiling to splash back areas, stainless steel sink and drainer, space for appliances, karndean flooring and under floor heating. Carpeted flooring, two double glazed windows to rear aspect, fitted wardrobes, TV, under floor heating and door to ensuite. Tiled flooring, low level wc, bath, bidet, wash hand basin, part tiled walls, shower cubicle, TV, double glazed opaque window and towel radiator. Laminate flooring, two double glazed windows to rear aspect, under floor heating and fitted wardrobes. Carpeted flooring, two double glazed windows to front aspect, fitted wardrobes and under floor heating. Carpeted flooring, two double glazed windows to front aspect and under floor heating. Tiled flooring, double glazed opaque window, towel radiator, wash hand basin, low level wc, bath, part tiled walls and extractor fan. With two up and over doors, a large garage with pitched roof having the benefit of power, lighting and alarm. 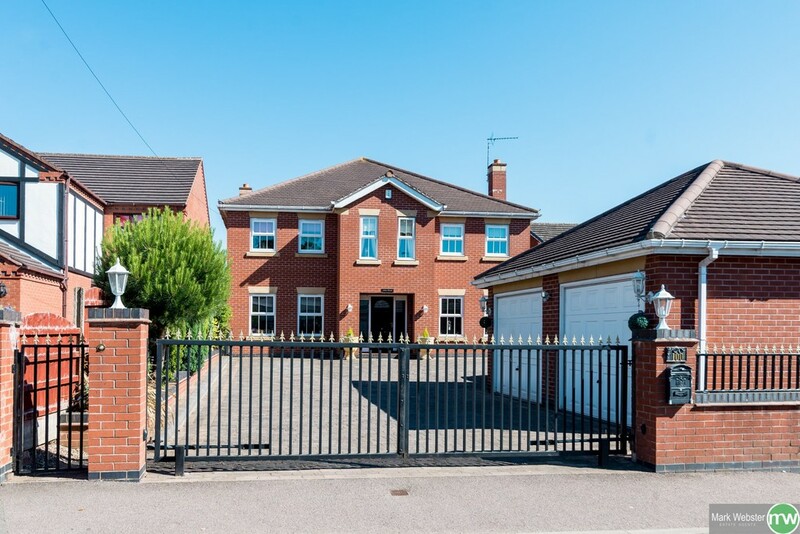 To the front there is electric gates, block paved driveway with space for multiple vehicles and access to the double garage which has a separate alarm system and side access to the rear garden. To the rear there is a large lawn area, decked sitting space, hot tub, gravel feature areas and a rear gate leading to a parcel of land which the property has a right of way over for in excess of 900 years. FIXTURES & FITTINGS: Some items maybe available subject to separate negotiation. The vendor has informed us that the property has an internal vacuum system that covers the whole house. *In addition we would advise some removal items as detailed in particulars are only included subject to asking price being achieved. SERVICES: We understand that all mains services are connected and the property.